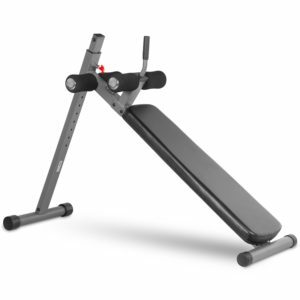 XMark XM-4416.1 is a solid, functional, ergonomic and high quality decline ab bench for home gym use, that you can do inclined sit ups and weighted incline sit ups on for more defined and stronger abs and core area at twelve different positions and angles adjusted by twelve vertical height adjustments. It is offered in two different colours of gray and white, both with very thick and hi-density 2.5 inch cushion and black Duraguard vinyl that is dual stitched and resistant to wear and tear and will help reduce the pressure on your body during your ab workout sessions. So you will get decent results on your regular ab exercises by targeting your abs from different angles without suffering from back pain and if you use it regularly on a daily basis you will start seeing results as soon as within a couple of weeks, if you also eat healthy mostly. Leg rollers- contoured roller pads support your legs and feet nicely and they help reduce back strain as they are positioned ergonomically and by holding the support handle in the middle you can get on and off it easily even at very steep angles. And you will feel safe and stable on its 14-gauge steel mainframe with powder coated finish that makes it resistant to scratch. XMark XM-4416.1 Decline Ab Bench is easy to put together (hex wrench provided) within less than half an hour and after you set it up you can adjust the height vertically for better storage purposes but you can’t really take it apart easily- stand and the cushion sections stay attached as there is a bolt at the top with an end cap and so the bolt won’t come out easily. It is also easy to move around being not so heavy and with the round feet rolling nicely. This is a great decline ab bench that feels rather solid, stable and comfortable except for the chrome end caps that keep the leg rollers in place do not stay in so if you don’t want them to fall off you may want to glue them. You have the option to get the more expensive XM-7608 model on Amazon.com if you have the extra cash as it costs 88 dollars more at the time of this review and if you want extra durability and comfort with thicker cushion but this one is better than cheaper competitor models for sure. Warranty by XMark is for the life of the product, which is also a great indicator of how sturdy and durable this ab bench is so you can have a peace of mind.